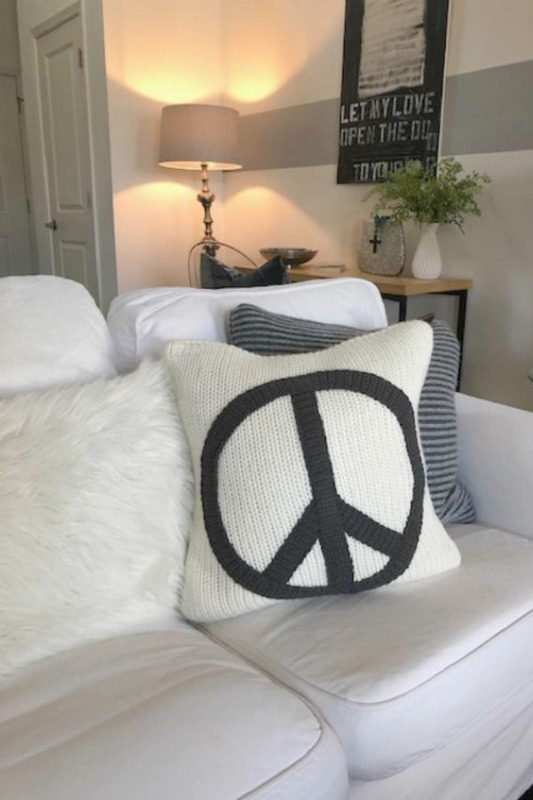 My sister’s suburban Chicago home has crisp white interiors with plenty of transitional, unfussy, Scandinavian style. 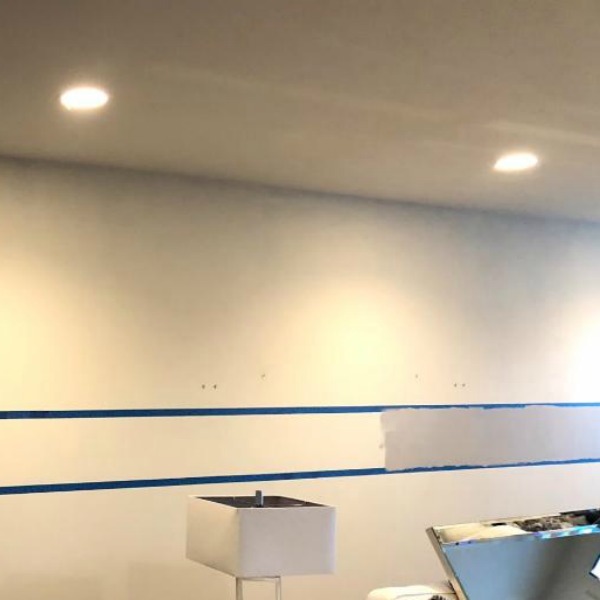 She has begun to move beyond her formerly minimalist ways, adding interest with help from the easiest, cost-effective, and tried and true trick in the book: PAINT. 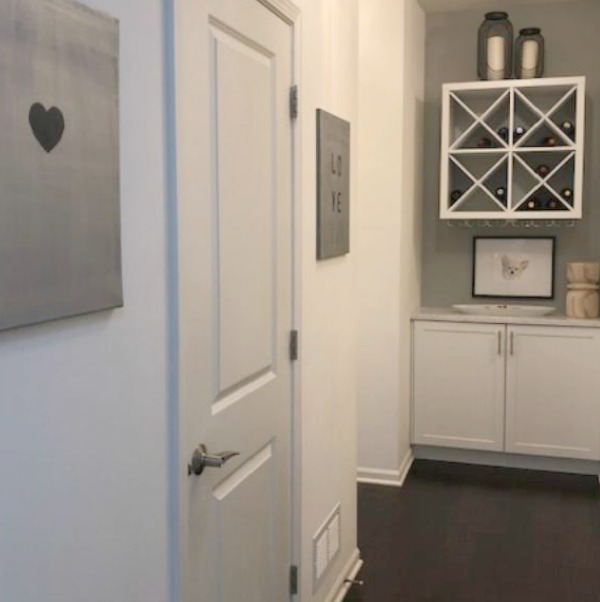 Since I am asked about paint colors every single day, today we’ll consider: a versatile medium grey paint color you might want to sample, as well as tips for How to Accent Walls 3 Ways With One Paint Color. 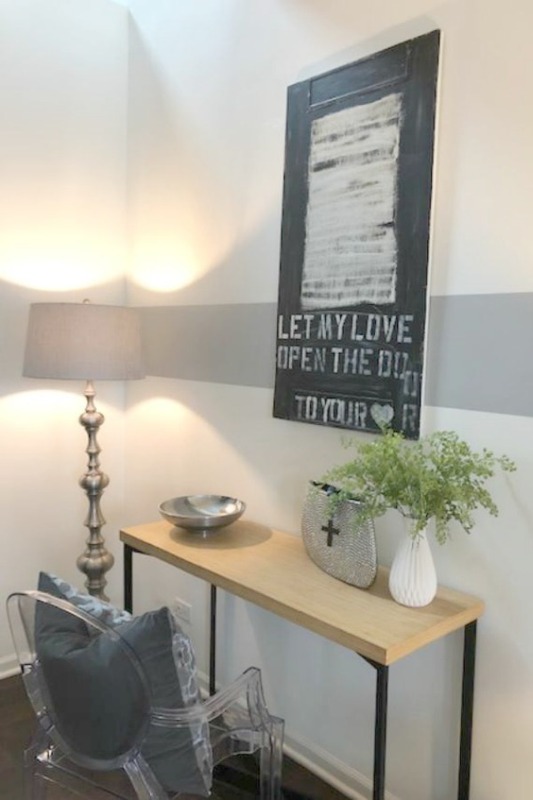 You’ll see the same grey paint used as a stripe accent, for stencil drama, and to highlight a niche. Photo: Hello Lovely Studio. How to Accent Walls 3 Ways With One Paint Color…certainly lovely indeed. Interior Design Ideas for Best Paint Colors as well as Tips to Paint Accent Walls. White paint color: SHERWIN WILLIAMS Pure White. 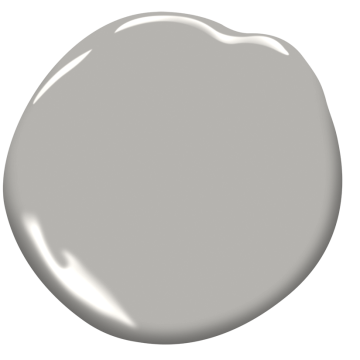 Grey paint color: BENJAMIN MOORE San Antonio Gray (60% strength). Painting above console: Michele of Hello Lovely. My sister is the hugest supporter of this blog and always willing to take photos and help. She collects my paintings, and most of the artwork pieces in her home were created by me. Selfie of Jo and me…she’s my partner in crime and makes me laugh harder than anyone else. 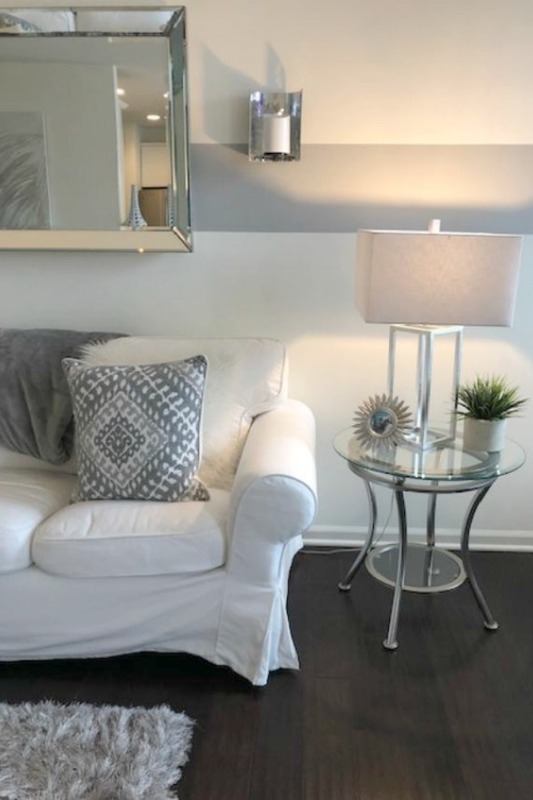 An important note about how one grey paint color was used as an accent in three different ways...the color was adjusted based upon the room’s light conditions. In a bedroom which receives plenty of daylight, the color was used at full strength. 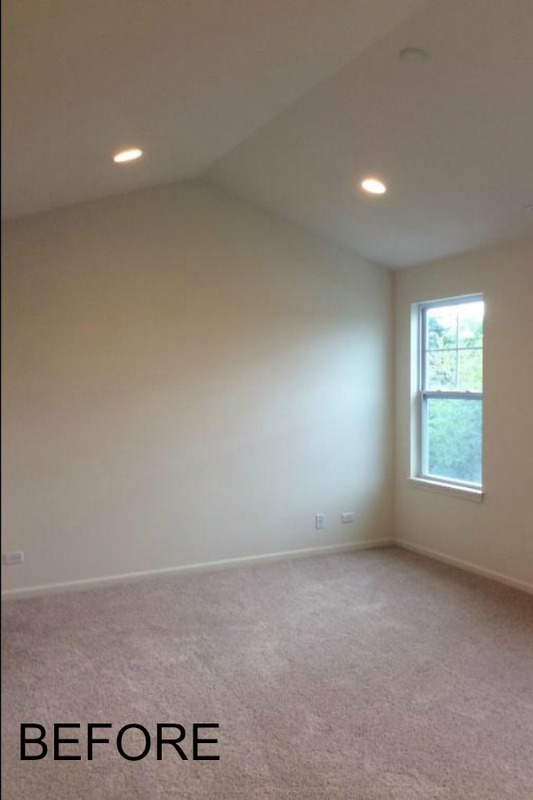 In the more dim living room, it was cut with white to 60%. And in a hall with no windows, the color is at 40% strength. For more designer advice about choosing the perfect paint color for your projects, see THIS and THIS. Photo: Hello Lovely Studio. How to Accent Walls 3 Ways With One Paint Color…certainly lovely indeed. Interior Design Ideas for Best Paint Colors as well as Tips to Paint Accent Walls. 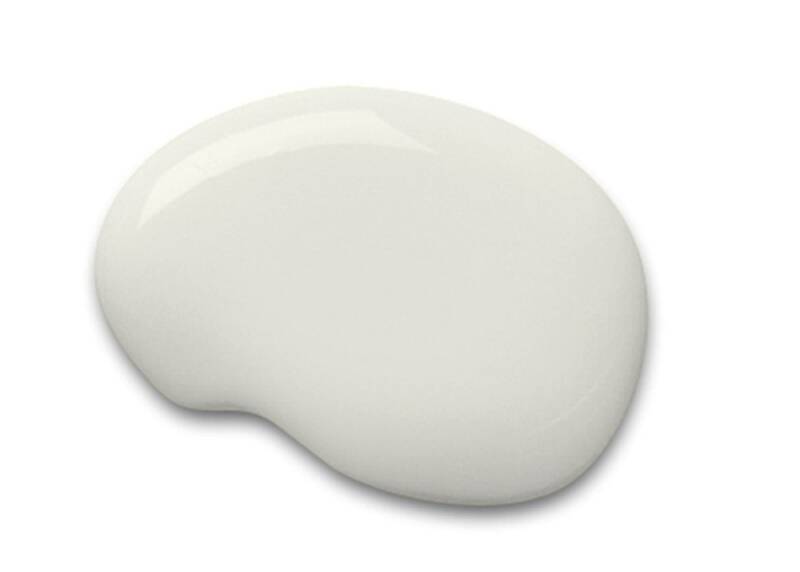 White paint color: SHERWIN WILLIAMS Pure White. Grey paint color: BENJAMIN MOORE San Antonio Gray (40% strength). 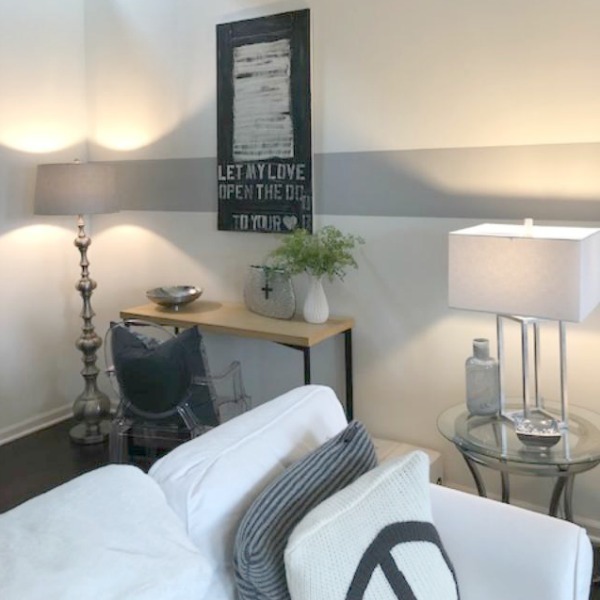 To break up an expanse of white on a living room wall, a wide stripe of Benjamin Moore San Antonio Gray (at 60% strength) adds contrast and architectural interest. Photo: Hello Lovely Studio. 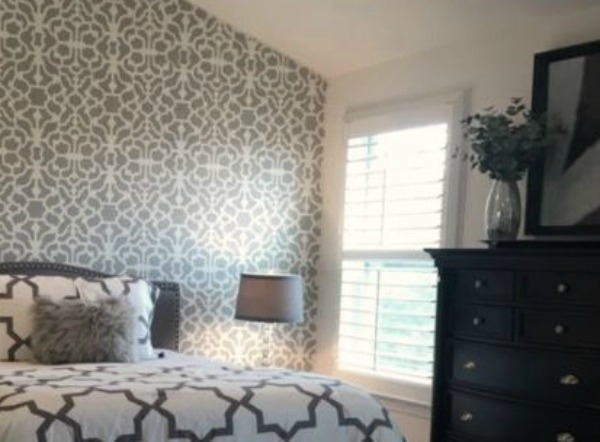 How to Accent Walls 3 Ways With One Paint Color…certainly lovely indeed. Interior Design Ideas for Best Paint Colors as well as Tips to Paint Accent Walls. 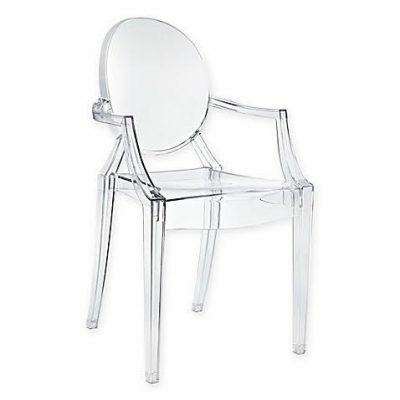 White paint color: SHERWIN WILLIAMS Pure White. 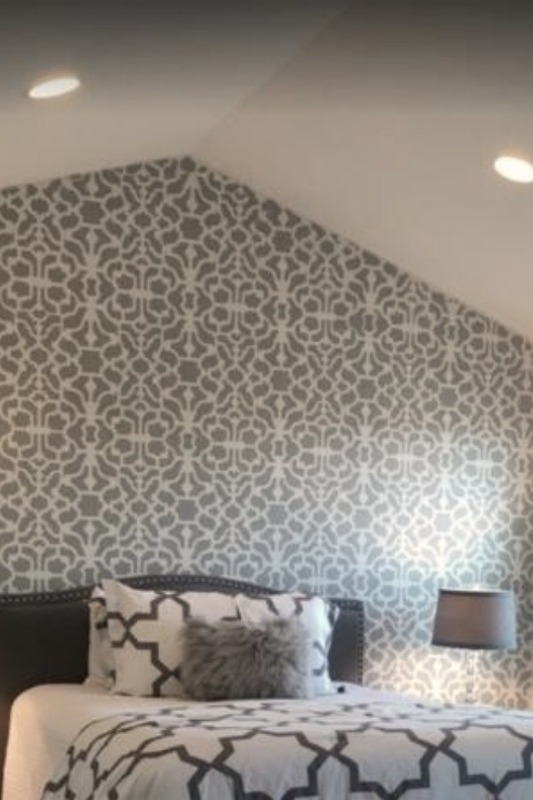 Grey paint color: BENJAMIN MOORE San Antonio Gray (60% strength). 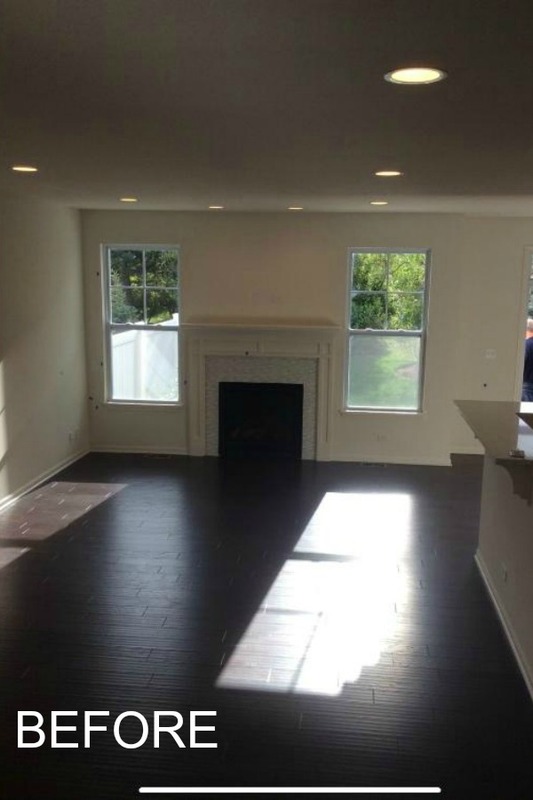 Here’s a peek at the living space before anything was moved into it. 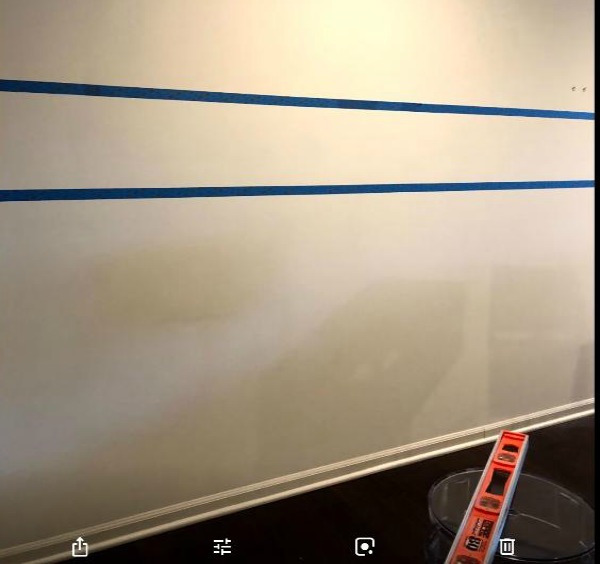 A laser level can make taping off the area to be painted easy peasy. Rolling on the paint is also a walk in the park…no cutting in at the ceiling! 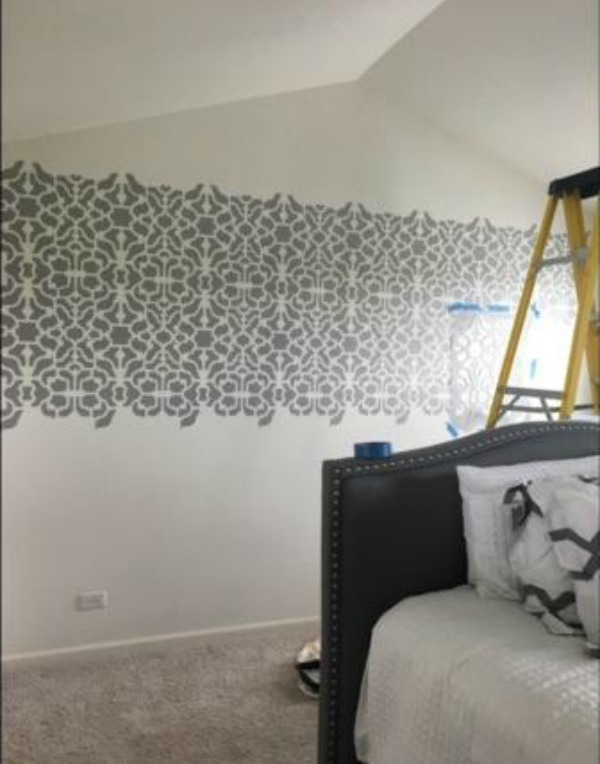 A stenciled statement wall is one of the most cost effective ways to add drama–in this case, bold drama–to a bedroom wall. 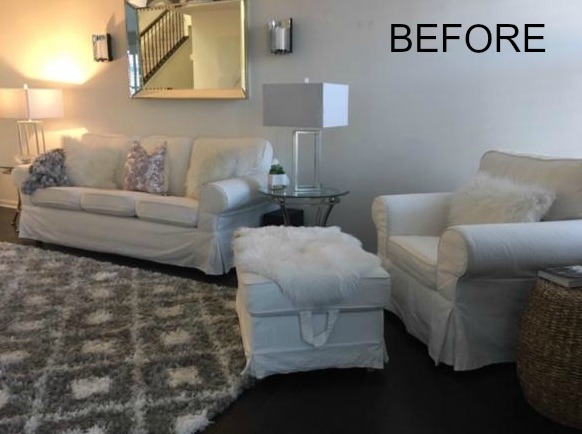 Benjamin Moore San Antonio Gray (at 100% strength) was rolled over the base color (Sherwin Williams Pure White). Keep in mind that using a great big stencil = much less time! My favorite stencil of all time is called Fortuny: find it here. Find the post where I used that stencil in a dressing room RIGHT HERE. I think it’s helpful to see the process of such an undertaking so you know what to expect should you choose to follow suit. At this point of the process (see above), you might think ‘what in the world have I done!? !’ But keep going! It’s only paint, and it only takes an afternoon of work. Photo: Hello Lovely Studio. How to Accent Walls 3 Ways With One Paint Color…certainly lovely indeed. 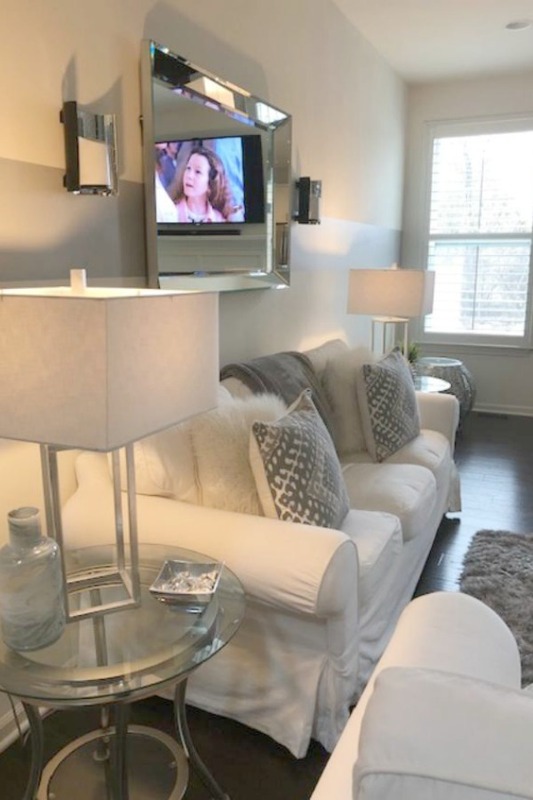 Interior Design Ideas for Best Paint Colors as well as Tips to Paint Accent Walls. White paint color: SHERWIN WILLIAMS Pure White. 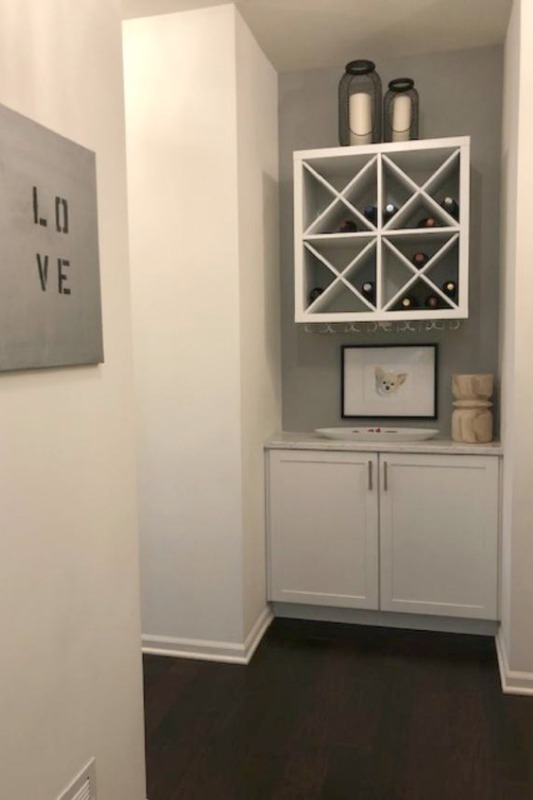 Grey paint color: BENJAMIN MOORE San Antonio Gray. What a transformation! 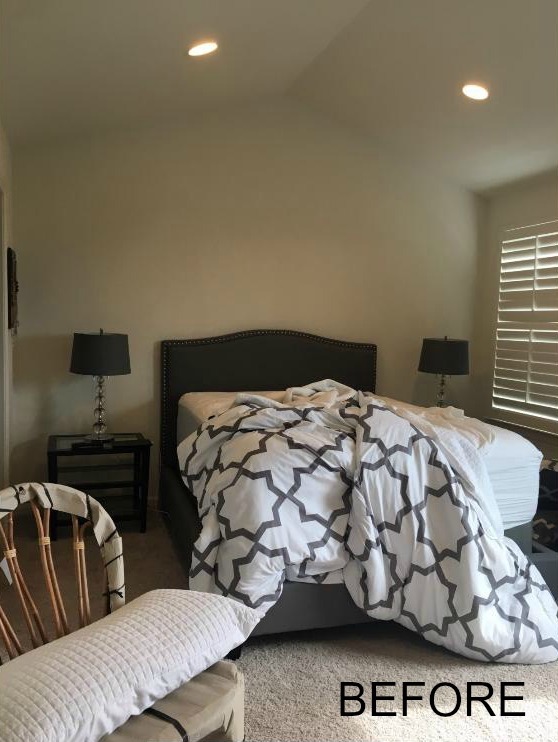 My sister has added completely different accent colors and bedding since these photos were taken – proof positive that this grey and white stenciled wall is fairly neutral and easy to work with. A few years back in Chicago. What a difference when you paint a wee niche a contrasting color. 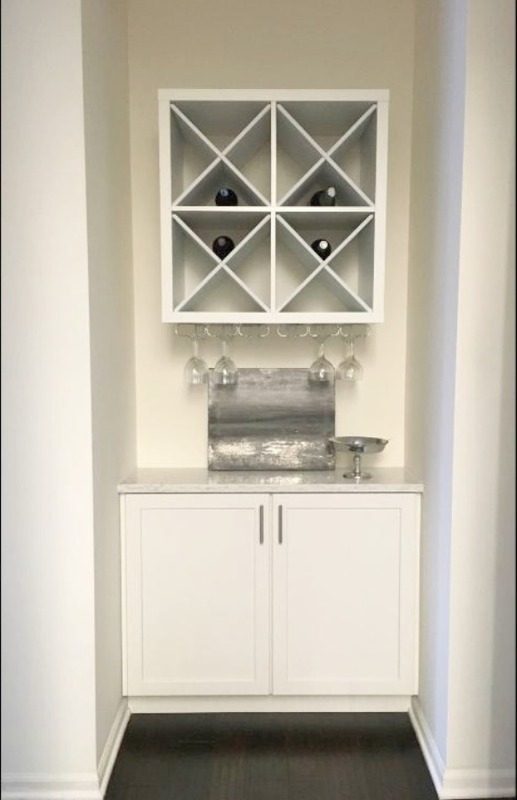 In this case, Benjamin Moore San Antonio Gray (at 40% strength) adds importance and depth to this entry area which doubles as wine storage and a bar area when company comes. SHERWIN WILLIAMS Pure White. 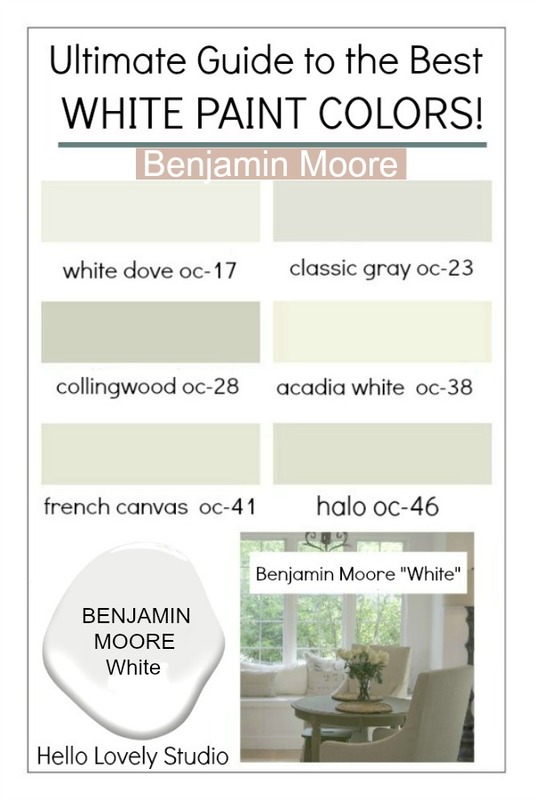 Find more bestselling Sherwin Williams whites according to Architectural Digest HERE. 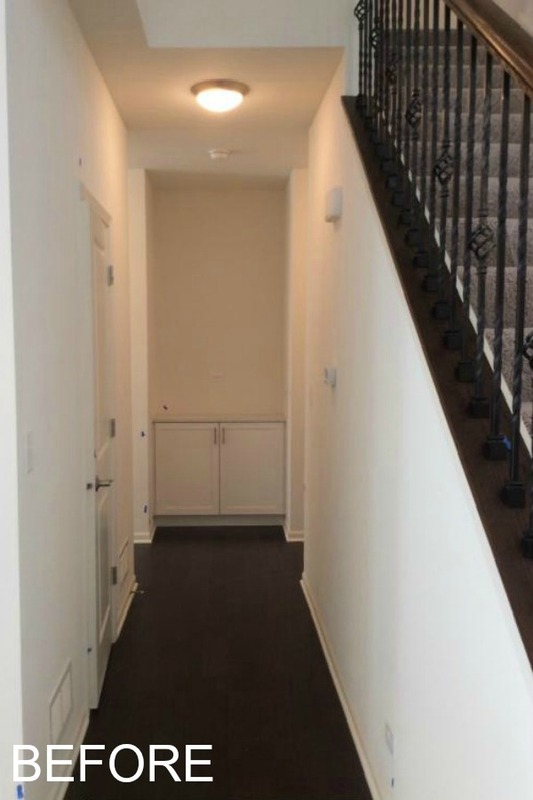 My Sister Lived in New York for Years, and Here’s a NYC Townhouse My Sister Will Love to Tour…Maybe You Will Too…peek inside! 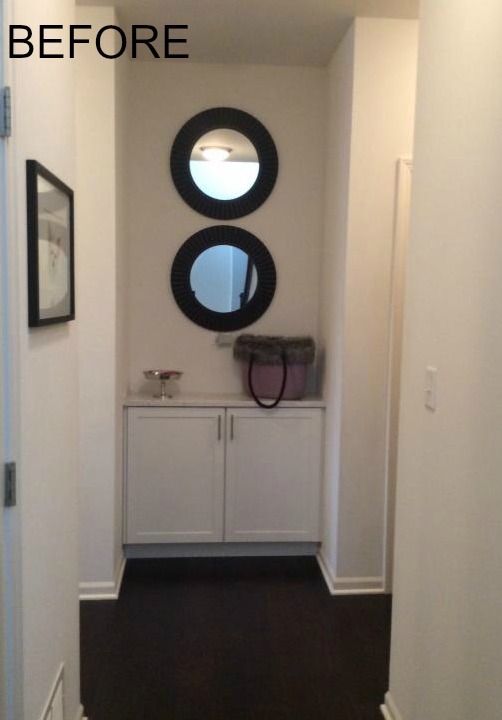 Next Post Fall for an Amazing One Bedroom Wonder Home! It os amazing to see the power of paint! Your sister has a lot more patience than I do to stencil that accent wall in the bedroom. So much inspiration. I love it all. First I must say how lucky you are to have such a wonderful sister that you share such a special relationship with. 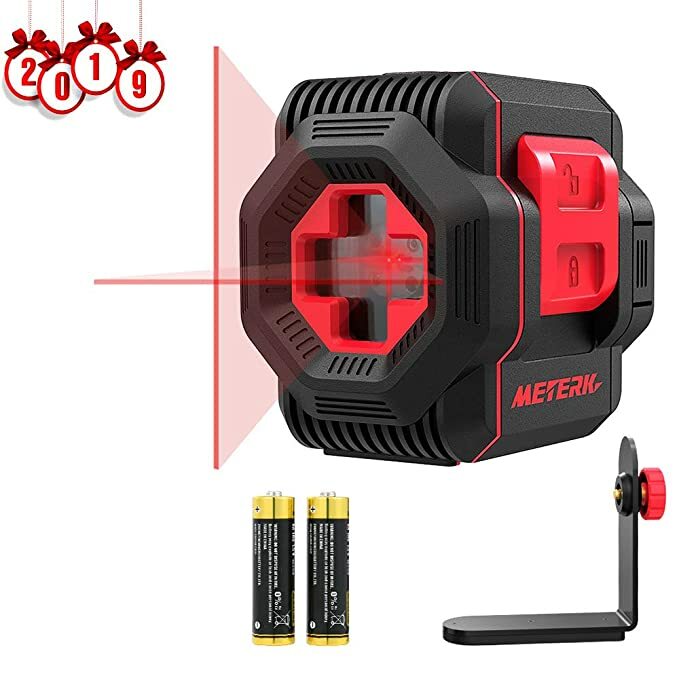 What a gift that is! 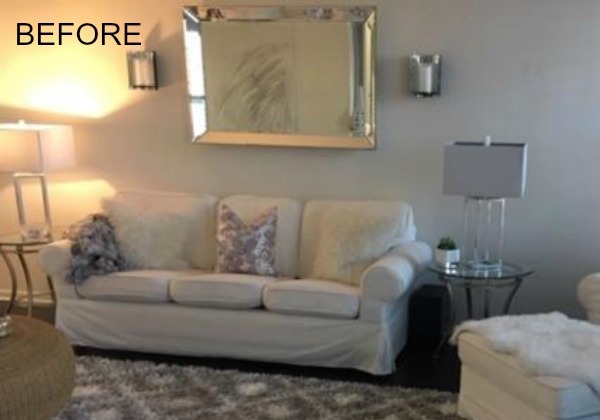 I’m a real fan of gray paint too and used it extensively in my most recent flip. 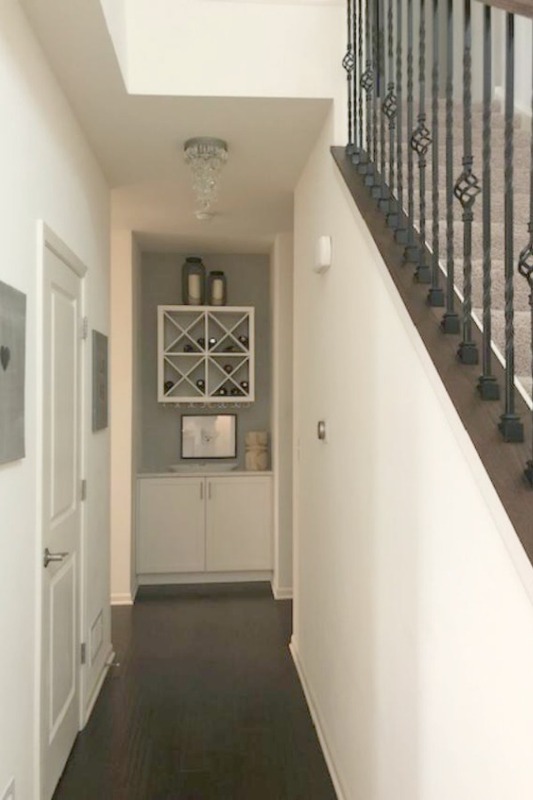 It looks great all throughout your sister’s lovely home. 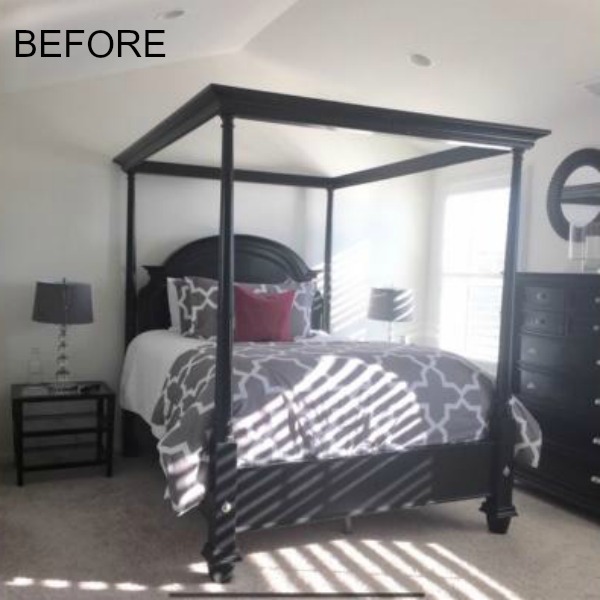 I’ve never tried stenciling but I may just have to do so now that I’ve seen how it can transform a room so beautifully. We’re so blessed – yepper! 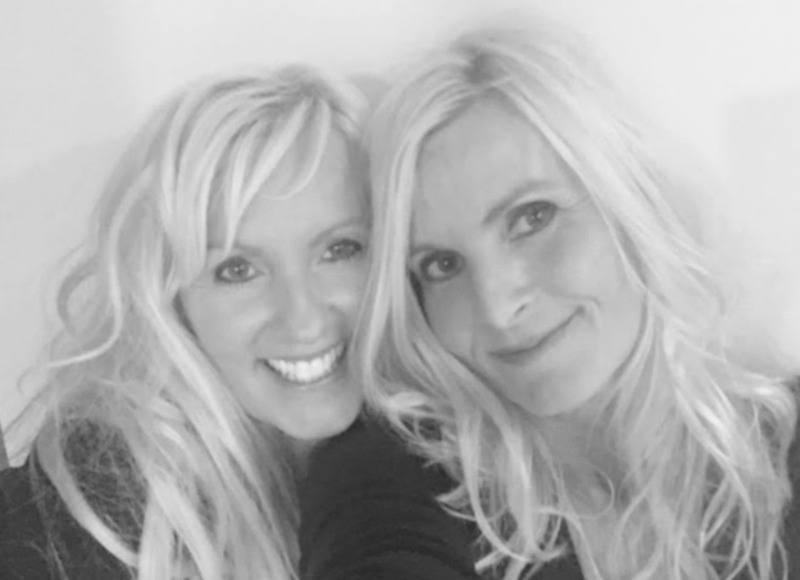 We don’t take our friendship for granted, and you’d be surprised how many folks will take one of us aside and ask, ‘but are you REALLY that close?’ As if sibling rivalry is always lurking. We have so many different qualities and no time for jealousy. 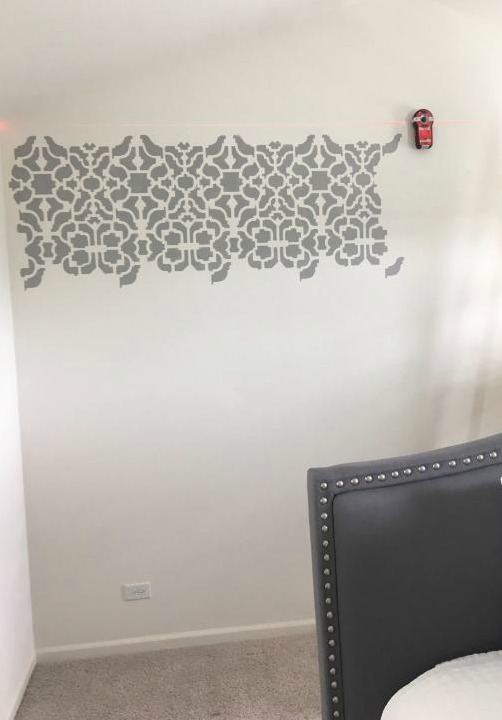 I am ready to try another stenciling project too – it’s the easiest way I know to quickly create drama on a wall. 🙂 Thanks for reading, Celia! I love seeing pictures of you & your sister, Jo. It’s such a loving relationship between siblings. You are blessed, my friend. This is all so wonderful, and OH! 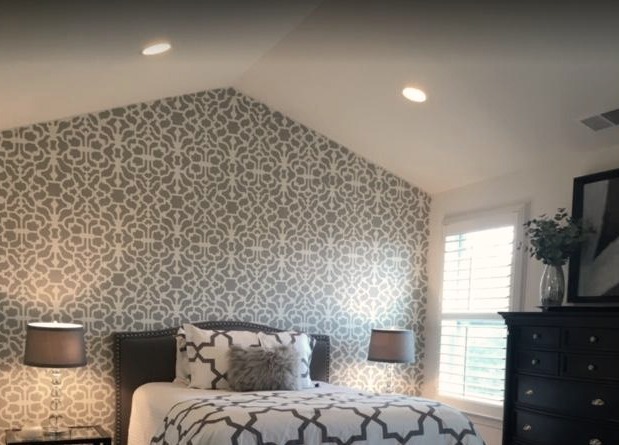 that stenciled wall!! Beautiful! Thanks so much for sharing at Thursday Favorite Things!